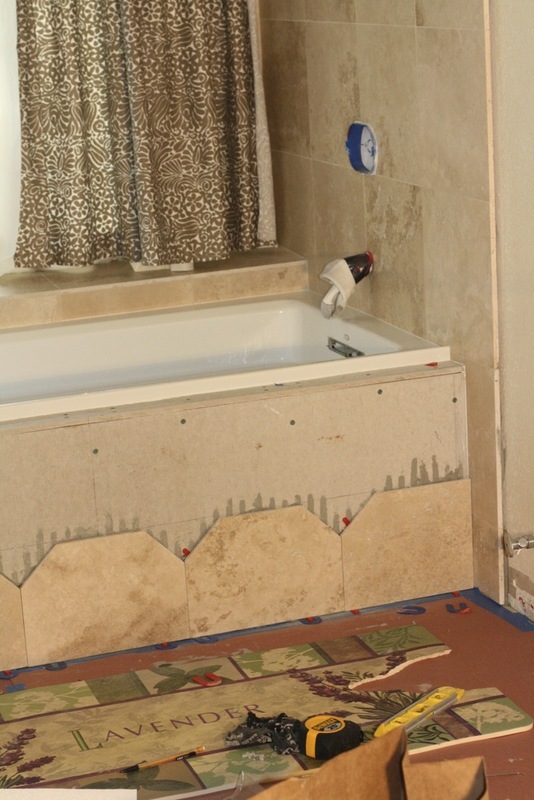 Steve finished the tile work on the front of the tub, also called the apron of the tub. We seriously had JUST enough tiles to do the apron, so he only had one chance to get it right, and after only a few cusses, he did it! And it looks amazing!! We decided to wait to do the apron until after the floor was in, so that the entire tub unit appears as if it is sitting on top of the floor, rather than behind it. Originally, we were going to use the same surface for the top of the apron as the vanity top, but since we decided to go with concrete (rather than granite or marble) we decided not to do that after all, and filled in the top with the travertine tile as well. I think this was a good choice so that the entire bath/shower area looks cohesive and simple. There are countless decisions to be made during a remodel and as you can tell, we learned as we went, changed our minds a thousand times, 'slept on it' many nights and I think so far all of our patience and thoughtfulness is proving worthwhile! 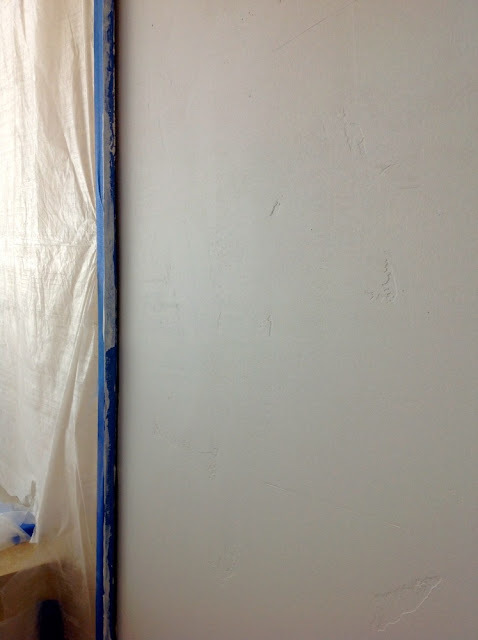 After all of the work Steve did up to this point, he decided to let a professional tackle the drywall repair and prep for painting. 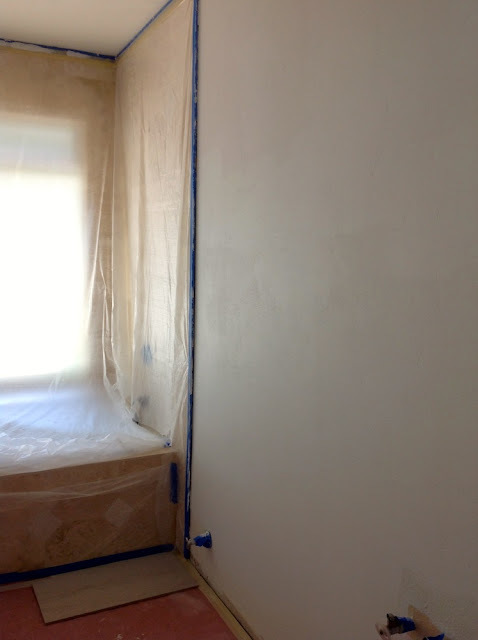 We are so happy we hired help because it was done so quickly, and through conversations with the contractor we decided to re-texture the walls to a more modern look. 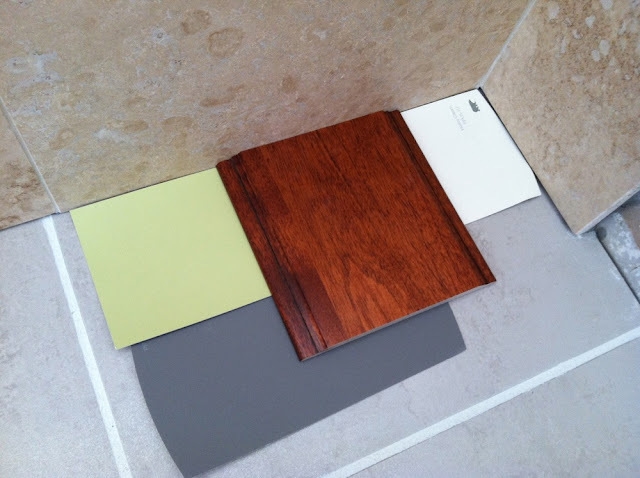 So the entire bathroom was re-textured to a smooth finish with a rustic flair. You know you are getting close to the end of a project when you can start picking out paint colors!! Here is what we decided for our color palette. The wood sample is the actual wood and stain of our new vanity (arriving any day now!!) It is a birch wood with an "espresso" finish. I think it will give a nice modern look, while keeping with the outdoor, ranch feel. 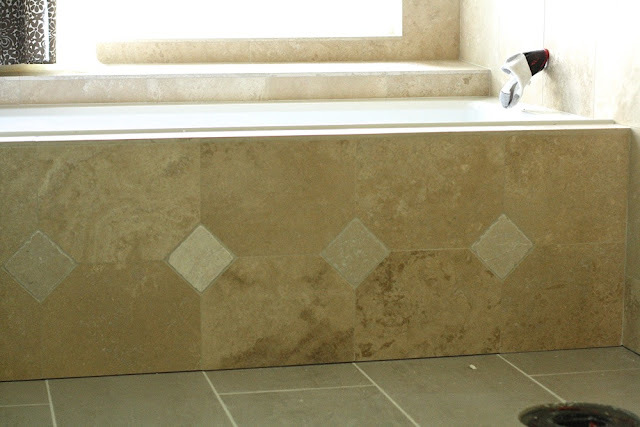 The dark swatch is representative of our concrete vanity top. So the paint colors we chose are soothing green tea and heavy cream. We with with green because through the extra large window, you can see trees, plants and rose bushes, so the green will really bring the outdoor element in. The wall behind the vanity will be the light green, and the other walls and ceiling will be heavy cream. Last night we slapped on one coat of green and it looks gorgeous!! It is bright, cheerful, and it really is soothing! The heavy cream may have more yellow in it than we hoped for, so we are testing it out tonight and will see how it goes from there. The light fixture should be in any day now too and you should look forward to seeing it because it is divine (for a light fixture!) Once the vanity gets installed, the concrete guy will come make his template and it should take about 2 weeks to finish. 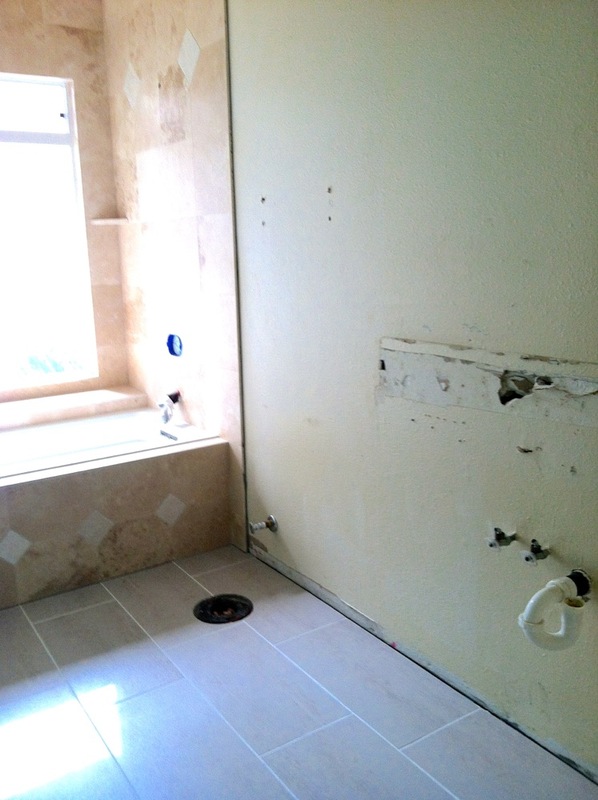 In the meantime we will be busy putting up last minute touches to the bathroom...the tile trim/molding around the shower, re-installing the toilet, installing our fixtures in the shower, and picking out towel racks, towels, and accessories! I am still hopeful for a Dwight Hotel reveal at the end of the month!!! Fingers crossed!